Although the ebook reader market has been dominated by the Kindle (still going strong) and the Nook (losing steam) for years, there’s a contender rising from the ranks: the Kobo Aura HD. Read on as we put it through the paces. What Is The Kobo Aura HD? Before we jump into looking at the actual ebook reader, let’s take a quick look at the company behind it. Although many readers, especially American readers, might be unfamiliar with the Kobo brand (it only has around a 3% market saturation in the U.S. market), it’s one of the largest ebook reader companies in the world, accounting for a sizable chunk of the global market (20% of the global market, more than the 16% share split between Sony and Barnes and Noble). In America, for example, you won’t find Kobo ebook readers on the shelves outside of a few large independent bookstores, but in Canada you’ll find them stocked at all sorts of big box stores like Best Buy, Walmart, Staples, etc. Kobo produces ebook readers in a range of sizes from their tiny Kobo Mini (a pocket size reader with a 5″ screen) to their larger flagship ebook reader, and the one we’re interested in, the Kobo Aura HD. Let’s take a look at Aura HD. Note: Our reviews traditionally include a section devoted to new device setup. The Kobo, like the Kindle Paperwhite, has a very straight forward setup. You turn the device on, you connect it to a local Wi-Fi node, and you register the device with Kobo. Given how straight forward the setup is, we’ve opted to skip detailing it screen-by-screen. 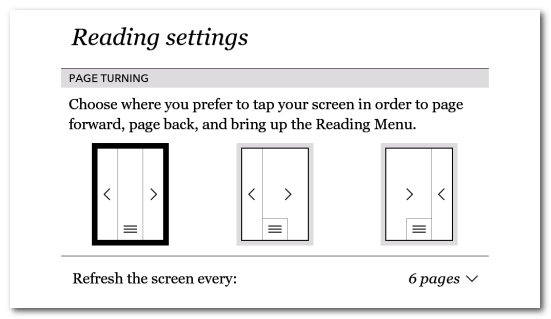 If you have any questions about the specifics of setting up the Kobo over Wi-Fi or trouble shooting the initial setup, please refer to Kobo’s Setting Up Your eReader guide here. Viewed head on, the Kobo Aura HD (herein referred to as the Aura HD for brevity) looks like most ebook readers: it’s rectangular with a matte black bezel, it has a recessed matte finish screen, and it’s branded with the company logo at the bottom center of the bezel. Also like nearly every modern ebook reader, there are no external page turn buttons as everything is handled via the touch screen. Where the Aura HD begins to stand out in the form and styling department, is when you view it from the side or flip it over. 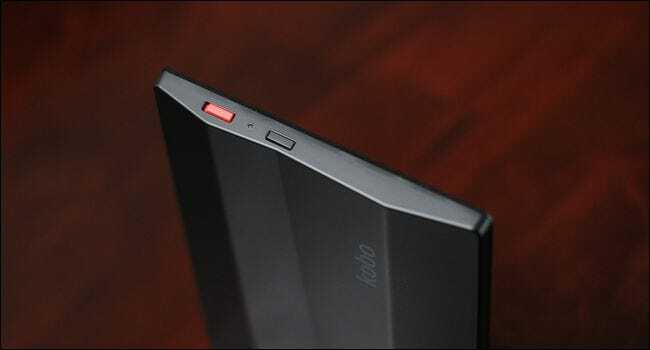 The body of the Aura HD has a distinctly angular construction not seen on the bodies of competing ebook readers. While we were at first apprehensive about the design choice, the slight angling of the body does in fact make it more comfortable to hold the device as it provides a slight and natural groove for the fingers to press into. Interestingly enough, we didn’t notice that the angles/grooves are spaced differently until a left-handed friend tested the unit out. The spacing of the finger holds on the back definitely, however minutely, favorites holding the device with you right hand. The top of the Aura HD has three elements: a red slider-style power button (why red? it looks terribly out of place with the rest of the black styling on the unit), a tiny LED activity/charging indicator light, and a black button that toggles the front-lighting on and off. While it’s nice having physical buttons for things, we didn’t care much for the physical front-light button. On the Kindle, for example, you adjust the front-lighting by tapping on the light bulb icon and you immediately see there is a wide gradient of potential brightness settings. The Aura HD, on the other hand, ships with the brightest setting enabled so when you turn on the front-light for the first time it’s easy to think that it’s a binary system: off completely or on and insanely bright. (When the front-light is on, there’s a little icon in the navigation bar you can tap on to adjust the settings). On the very bottom of the unit you’ll also find three elements: a micro USB port for charging and syncing the unit, a MicroSD slot for expanding the unit’s storage capacity, and a tiny pin hole reset button which can be triggered with a paperclip. We’re huge fans of both of these features. While most ebook readers ship with enough internal memory to hold thousands of books (and the Aura HD is no exception) we’ve always like the ability to expand an ebook reader with a microSD card (and were very disappointed when the newest Nook readers dropped this feature). Sure, not everyone feels the need to carry every ebook they’ve ever acquired with them, but for those who do they can use up to a 32GB microSD card in the Aura HD to push their storage potential from a few thousand books to tens of thousands of books. There’s no special formatting or tinkering required to use the microSD either; take any common Fat32 formatted microSD, copy your ebooks over to the root directory, and stick it in the Aura HD. The microSD’s contents will be automatically added to the device’s library. The reset button is also a nice touch. Ebook readers tend to be really stable devices, but during those rare times that they lock up, it can be a huge pain to get them to reboot/reset themselves. A physical reset button is a welcome addition for those rare times you need to reset your device. In terms of overall size, the Aura HD is larger but not necessarily unwieldy. The Aura HD is 6.97 x 5.05 x 0.46 in and weighs 8.5 ounces. The Kindle Paperwhite is 6.7 x 4.6 x 0.36 in and weighs 7.5 ounces. The Aura is bigger both in dimensions and weight, but for those extra fractions of an inch and ounce you end up with a bigger higher resolution screen. The Aura HD is significantly chunkier, in this regard, than the Kindle. Some people like gadgets that are as slim and light as possible, other people want something that’s easier to hold. By that measure, the Aura HD does have a significantly beefier shell with the raised finger holds. Given that you’ll spend more time staring at the screen of your ebook reader than you’ll spend doing anything else with it, the screen is the most critical component. In that arena, the Aura HD’s screen is both objectively and subjectively the most beautiful screen on in the ereader market right now. If you read our review of the Kindle Paperwhite, you’ll recall how much we liked the crisp screen. The Kindle Paperwhite sports a nearly-XGA resolution screen (6″, 758×1024 pixel, 212 ppi) where as the Aura HD sports a bigger and better WXGA+ resolution screen (6.8″, 1440×1080, 256 ppi). Do those extra pixels and ppi make a difference? Absolutely. While there’s nothing wrong with the lower-resolution Kindle Paperwhite screen (and it’s certainly better than just about any other ebook reader screen out there), the Aura HD’s screen is beautiful. It’s the first ebook reader we’ve ever used where we’ve completely forgotten we’re looking at a digital screen. Regardless of any complaint we might have about any other element of the Aura HD design, interface, or user experience, the screen is undeniably the best around and the sharpest one we’ve had the pleasure of reading on. The front lighting, once you figure out that there’s a button to turn it on and off as well as an on-screen adjustment to make, is quite nice. We were braced for poor front lighting, as this is typically something manufacturers have struggled with (and fumbled through). The first generation Kindle Paperwhite, for instance, had this terrible uneveness in light distribution that wasn’t fully remedied until the release of the second generation Paperwhite. With that in mind, we were pleasantly surprised to find that the back lighting on the Aura HD is great. The light is even, there are no splotches, and unless you turn the unit upside down and look towards the base of the screen at a very severe angle, you can’t even see the light source. Only at that upside and severe angle do you see the hint of the LEDs that light the screen. Given how much the poor light distribution on our first generation Kindle Paperwhite bugged us, we were primed to pounce on any defect we found in the Aura HD’s lighting, but we found nothing to complain about. Under the hood, the Aura HD sports the snappiest ebook reader chipset on the market with a speedy 1GHz processor. While this puts the Aura HD a full 20% faster than any other ebook reader, it’s honestly a negligible benefit in most cases. In day to day use, a slightly faster chip doesn’t translate into radically faster rendering and page turns. Where we did find that the faster processor helped is when adding lots of books to the device; the Aura HD added and indexed books significantly faster than the Kindle Paperwhite. We side load a lot of content onto all our ebook readers, and what the Kindle would choke on (and then spend several minutes indexing and grinding through), the Aura HD would index in around 15-20 seconds. The Aura HD sports 4GB onboard storage, expandable via microSD card to 38GB (4 internal + 32 via card). By comparison, the Paperwhite sports 2GB. As we mentioned earlier in the review, if you’re looking to carry your whole library with you, the Aura HD has the clear edge. Battery life is typical for an ebook reader: like the Paperwhite, you can expect up to 8 weeks of casual daily use. When it comes to the actual GUI and interacting with the device, we found the experience to be quite a mixed bag of things we absolutely loved and things that frustrated us. First, let’s look at the source of Kobo’s marketing claim that Kobo ebook readers, especially their flagship Aura HD, are designed for serious readers. We’ve already checked “crystal clear” screen off the list of demands that serious readers make of their ebook readers. The other elements that ebook reader power users lust after are smooth page turns (not a problem with the speedy 1 GHz processor), excellent font/page customization, and easy interaction between the user and the device. The Aura HD has, hands down, the most advanced font tweaking and adjustment system around. If you’re very particular about how your text looks, the combination of ultra-sharp screen and incredibly granular controls really helps the Aura HD stand out from the pack. This is the first time we’ve come across a device that allows you to customize not just how the screen looks but where you tap/swipe the screen to perform certain actions. So while we noted the angularity of the case favored right-handers (by a tiny amount) the designers clearly want the device to be useful to both right and left handed people based on how you can adjust the interface. While we loved the actual reading experience and were delighted with the customization options, one element of the experience we didn’t care for is the main home screen. Specifically, we hated that the tiled interface is constantly moving on you. We didn’t dislike the individual elements (such as displaying the last book read, recently finished, suggested books, etc.) we disliked that based on what you’d recently opened (or what the device had recently updated), the tiles moved around the screen. One minute the library tile might be at the top corner, the next it was in the middle, then at the bottom. It was disorienting and it prevents you from navigating your device on auto pilot. You never get used to the feeling that tapping in the upper corner will open the library or tapping in the lower corner will open up your reading stats page. We understand the idea they were going for here, that the most used tiles “float” to the top, but it’s extremely annoying in practice. Imagine, if you will, that your desktop icons moved around based on how much you clicked on them (or when you last clicked on them). What’s further infuriating about this setup is that you can customize just about anything on the Aura HD (everything from screen time outs to screen savers and everything in between), but you can’t stop the tiles from updating and sliding around. 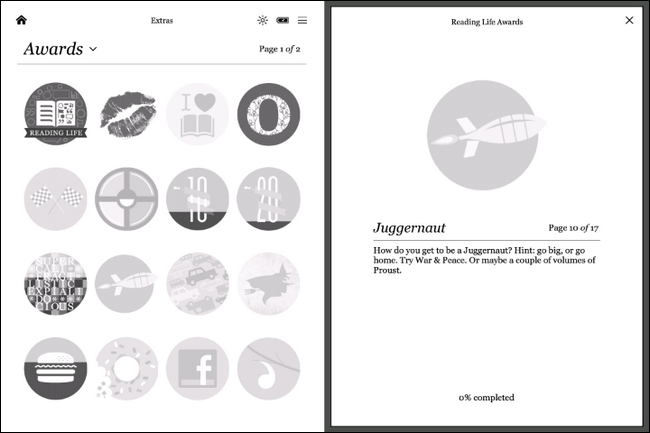 While some readers might think the whole game-badges and social media sharing element of the ebook reader experience are silly, there’s a lot to be said for the gamification of society and how making experiences game-like and social increases participation. If you hate the idea of tracking, badges, and sharing on social media, you can turn it off. We think it’s pretty neat though, and would like to see similar features come to other devices. The screen is sharp and the GUI is clearly very reader-oriented (albeit with an annoying home screen), so that leaves us with one serious subject to dig into: the Kobo ecosystem. Ecosystems are the life support system for ebook readers: a lack luster ebook reader backed by the worlds biggest product ecosystem will thrive, while the word’s finest ebook reader with a mediocre ecosystem will sit rotting in warehouses. While the total difference between our ten book purchases was around $20, realistically most people aren’t bulk purchasing the Time’s best sellers at once, and a few bucks here or there isn’t as big a deal (and there are certainly deals and discounts to be had in the Kobo store like any other store). Where the Kobo store suffers in comparison to the Amazon store is that the Kobo store comes off as almost completely sterile. Amazon has built itself a thriving community with tens of millions of book reviews and ratings, a healthy suggestion engine, and a sense that the place is bustling with activity and readers. By comparison the Kobo store, despite being stocked with the same books, feels empty. Let’s look at one of the books from the above list, as an example: David and Goliath by Malcolm Gladwell. In the Amazon store, as of the time of this article, the book has 946 reviews (not bad for a book that came out only a few months ago). 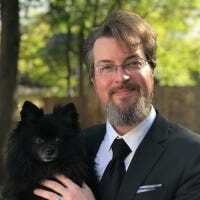 It also has suggestions based on what other customers purchased along with it, editorial reviews, an author biography, and auxiliary functions that many overlook (like discussion forums) but are still there as part of the community. By contrast, the listing for David and Goliath in the Kobo store is nearly empty. You get a brief synopsis, you get some related titles, and, glaringly missing from the experience, you get no customer feedback or reviews. You don’t even get any sort of editorial review or criticism. The Kobo store used to have reviews; it out-sourced them via the thriving reader community Goodreads. In the spring of 2013, however, Amazon bought Goodreads and Kobo dropped the Goodreads reviews from their store. Strangely, though, they appear to have made no move to replace them. Maybe they crunched the numbers and did the analysis only to realize that the reviews didn’t matter and their customers didn’t care; we, however, were unable to shake the feeling, despite finding all the books we wanted, that the Kobo store seemed impersonal and unvetted without them. You won’t have trouble finding the book you’re looking for, you’ll just feel like you’re shopping in a deserted store while you’re doing it. We’ve played with the device for the better part of a month now, read on it, poked around in menus, bought books for it, and we’ve given you a look at the device and the ecosystem in which it lives. After all that, we’re ready to report on the good, the bad, and whether or not the Aura HD is for you. The screen is beautiful. Not just good looking but hands-down-the-best-on-the-market beautiful. Photos can’t do it justice. 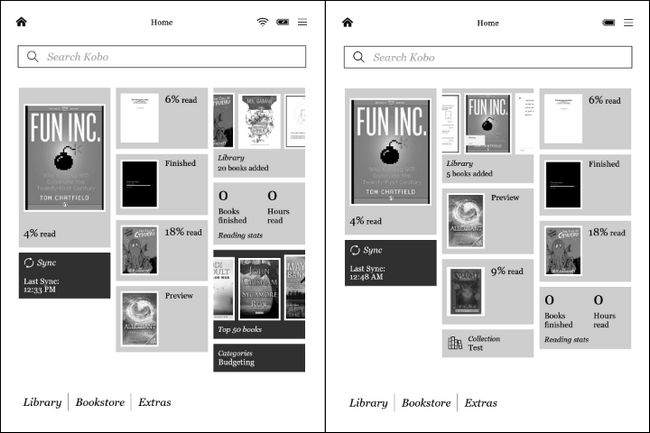 If you’re picky about fonts, spacing, justification, even tiny details like degree of font-sharpening, you’re not going to find an ebook reader that can hold a candle to the degree of tweaking and customizing you can pull off in the Aura HD. You can even adjust things like screen time outs and how frequently the device refreshes to cut down on ghosting. The front lighting is even and works well. Page turns and refreshes are snappy; the general in-book navigation, searching, and book marking is all pretty standard stuff that’s neither significantly better or worse than what you would find on a competitor like the Kindle. The microSD port ensures you’re not hampered by the 4GB of onboard storage (which is already twice as much as the Kindle Paperwhite offers). It supports a ton of formats including ePub, PDF, MOBI, TXT, HTML, CBZ, CBR, and various image formats like JPEG and PNG. 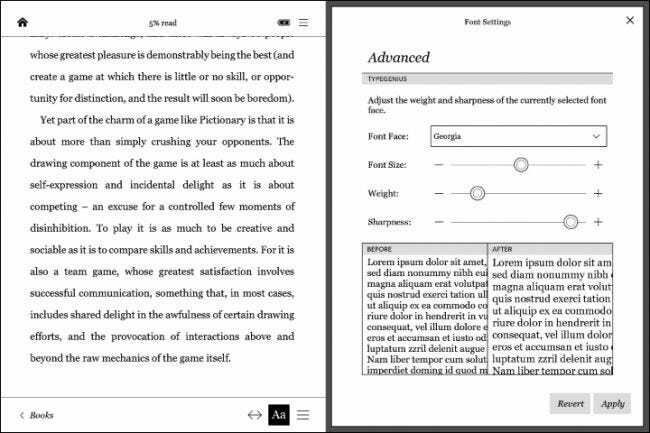 PDF handling is definitely best in class and runs circles around the Kindle. 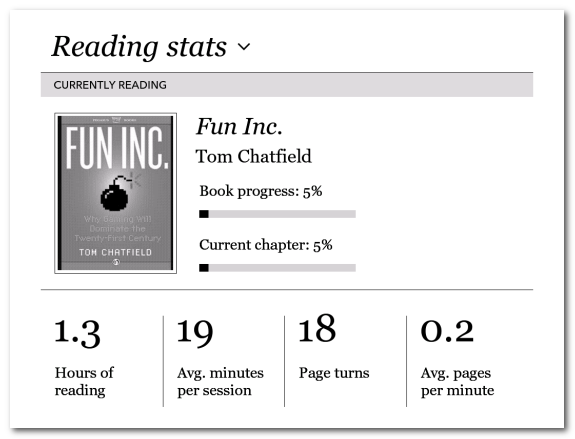 The reading tracking/rewards features are fun. While the angular finger grips on the back of the case look pretty cool, we’re not entirely sure they actually add anything to the experience, and they make the device feel really thick compared to other more slender devices (if you hate skinny ebook readers, however, this is a feature not a bug). We’d have preferred a more textured back in place of the angles. The home screen GUI lacks the sophistication and polish that is present in so many other elements of the GUI experience (like adjusting the fonts). The moving-tiles issue is extremely annoying. Despite being populated with millions of books and magazines, the Kobo store feels sterile and kludgy; we’d like to think that a company as big as the one producing the Aura HD (and with as big of a market share around the world) could produce something nicer. At $179, it’s the most expensive ebook reader on the market right now. The Verdict: Right now, the Kobo Aura HD is in no position to knock the Kindle off its throne, but that doesn’t mean you should turn your nose up at it. While we wouldn’t buy the Aura HD for a non-techie friend (because it simply lacks the dead simple ease of use and massive ecosystem the Kindle boasts), we would buy it for a someone with a huge ebook library who loves top-tier gear. That’s the market the Aura HD is resting in right now; it’s not an ebook reader for the Average Joe, it’s an ebook reader for the ebook enthusiast who wants the sharpest screen, the fastest processor, and doesn’t have a problem managing their own ebook library collection, tinkering, and tweaking. If that sounds like you or the person you’re shopping for, the Aura HD the crystal clear but quirky ebook reader you’ve been looking for.